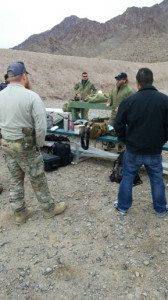 During Shot Show 2016 we had the change to get out to the Pro Gun Club, Boulder City, Nevada with Spartan Armor Systems and Instructor Zero. We shot up a Spartan Armor Systems ATC Armply Shooter Cut plate with their proprietary coating and one of our Spartan Armor Systems low profile carriers. The coating does an excellent job at containing the frag mitigation at 25 feet with 7.62×51 MM M80 Ball and 5.56x45MM(SS109). Check out the video below!! 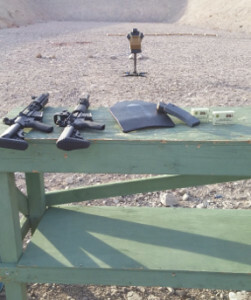 The Pro Gun Club is an awesome range and worked perfect for the Spartan Armor Armply Shooter plate and Beez Combat Systems Plate Carrier shoot up. 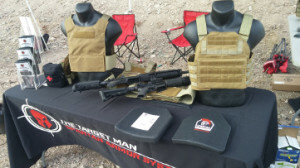 Spartan Armor Systems was one of the sponsors and was showing off their armor and targets. The carriers on the mannequins are two of our carriers we designing for their armor. The ECP carrier and the Spartan Armor Systems Shooter Plate Carrier Cumber. If you don’t know who Instructor Zero is you need to look this guy up. An amazing instructor that trains Special Operation groups all around the world.